As we reported earlier, State run PSU - Bharat Sanchar Nigam Limited (BSNL) will be launching Free Public WiFi Services initially in 10 major locations in Kochi by 15th May 2015. BSNL will be implementing the project in collaboration with the Corporation of Kochi and QuadGen Wireless Solutions. 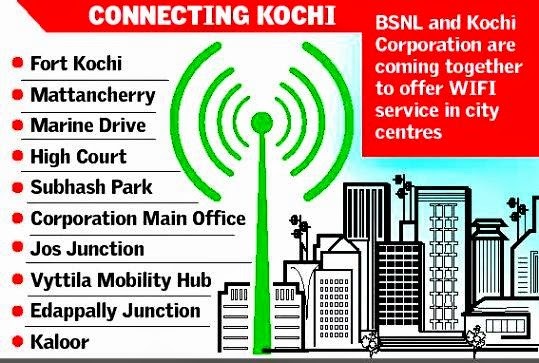 In the first phase of the project, WiFi facility is being made available at the Corporation office, Subhash Park, Marine Drive, High Court, Kaloor bus stand, Edappally, Durbar Hall Ground, High Court, the Court Complex, Mattancherry and Fort Kochi. Testing/Trial running of Free WiFi services started from 02-05-2015 onwards. As per information from BSNL sources, by 15th of May 2015, ten WiFi zones in major public centres of the city would be operational. BSNL will launching Free Wi-Fi zones having 300 metres of radius from the access point and a bandwidth of 10 Mbps would be made available to users. BSNL is also working on a proposal to have a total of 500 Wi-Fi hotpots across the State. BSNL Ernakulam alone will have 120 sites as part of this ambitious project. Dear readers, please share your views and opinions about BSNL's Free WiFi Services via comments with us.